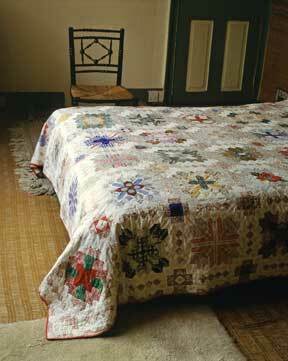 I have been drawn to this quilt for some time. Lucy Boston was born in England in 1892, and lived to be 98 years old. and garden near Cambridge in England, and for her long, creative old age. Lucy Boston published her first books when she was in her sixties, and she continued to write, sew, and garden when she was in her nineties. She was an extraordinary person, and still inspires affection and admiration today. 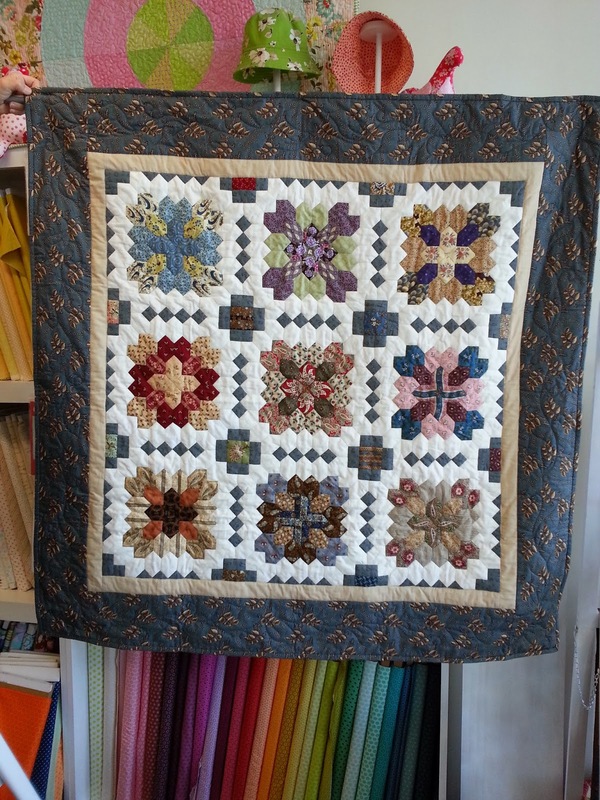 Then on our recent holiday I saw this in the window of Periwinkle Patchwork. On my first visit I purchased the pattern and some papers. 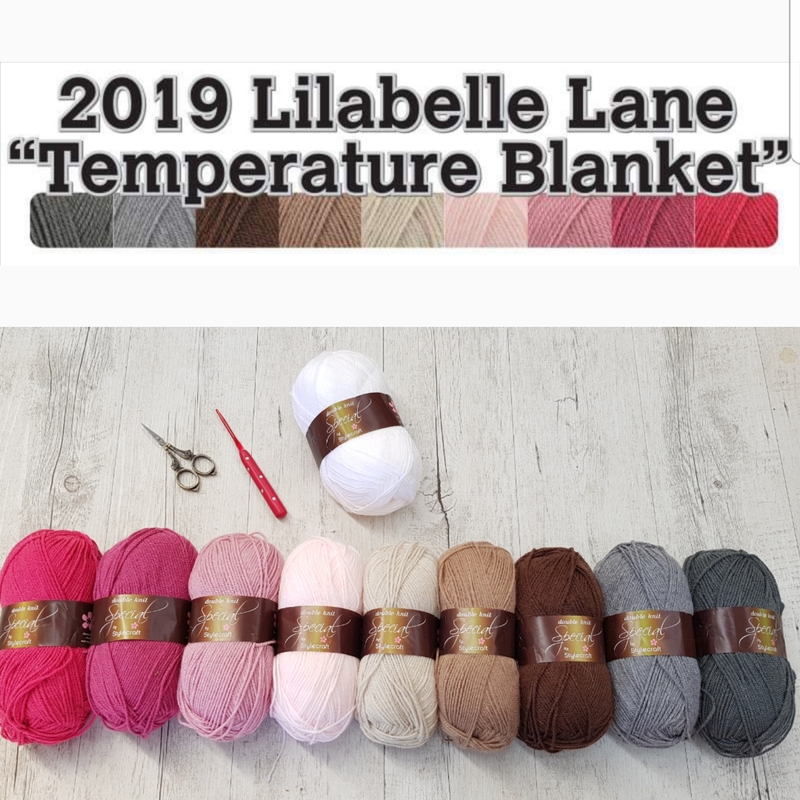 I found myself reading the history and pattern over and over again that night so I returned to the shop the net day and asked for a starter kit. 21 F8's later and I was ready to go. Not my usual fabric choices and I did consider using modern fabrics over the Civil War Reproduction Fabrics but decided to stick with what attracted me to this quilt in the first place. 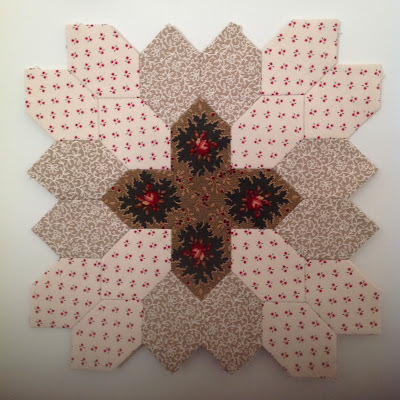 So since being home I have been playing with my blocks and fussy cutting. After looking online I obviously have a lot to learn and to be inspired by when it comes to fussy cutting. This will be another long term project for me as I don't have any Civil War fabrics in my stash. It's now time to restock the papers as I've run out already! 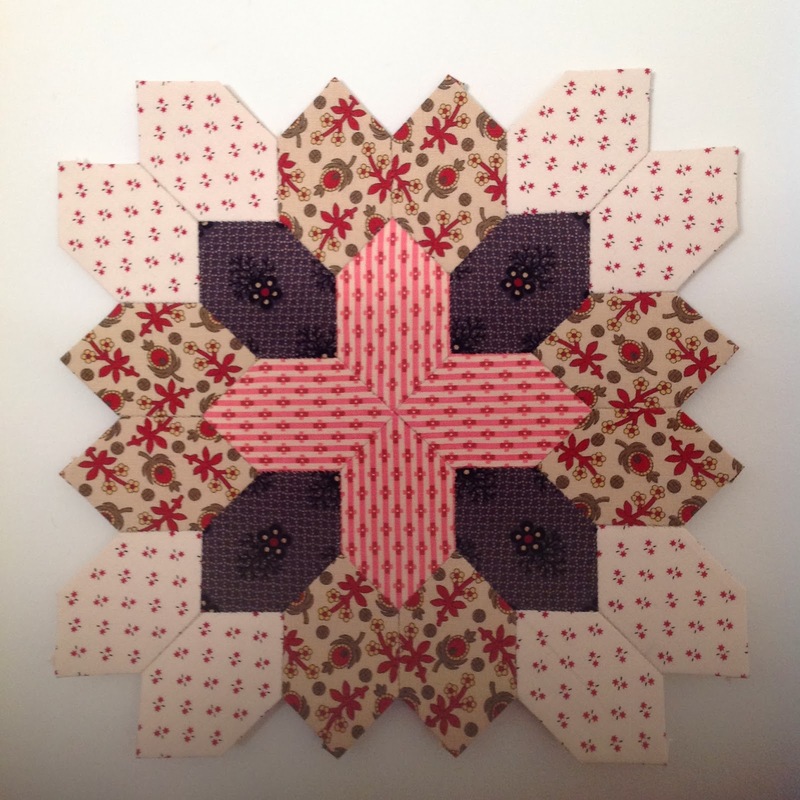 I think you are doing great wit the fussy cutting - it is a stunning quilt! Your blocks look fantastic, Sharon. 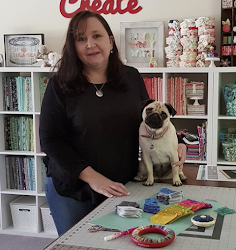 You put me to shame with how much sewing you get done! 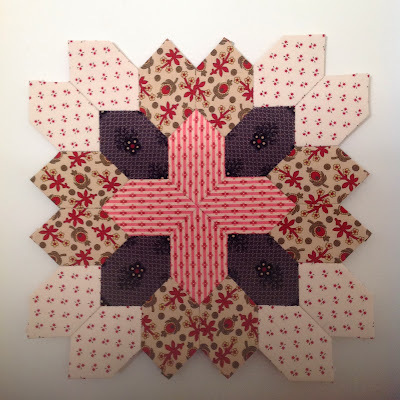 I am not a fan of civil war fabrics, but I am loving your blocks. I can't believe how many blocks you have made already! I think I need that pattern too now LOL. 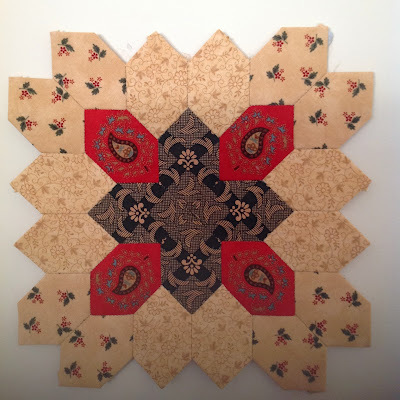 They look fantastic and I Loooooooove 1800s repro fabrics. Sharon you must be an absolute gun with all the work you get done (including laundry) those four blocks are amazing you have done the most wonderful job look forward to seeing the rest. You have been busy...they look great! Great progress already Sharon - what a magnificent design it is! - I think you will have it finished sooner than you think! It has been on my to do list for some years. I have been consoling myself with finding fabrics for it, and now that I have a pile there is really no reason I shouldn't start it. 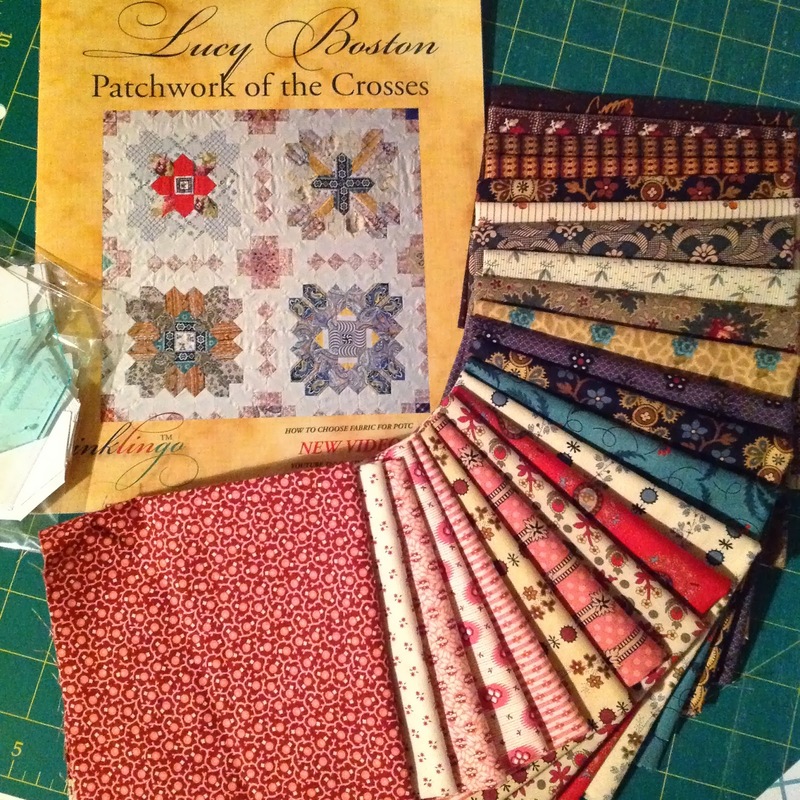 My daughter also gave me the book "The Quilts of Lucy Boston" written by her daughter. It is very inspiring. Your blocks are beautiful. I hadn't heard of Lucy Boston before (must have totally missed her books) but her home seems to be pretty close to where my parents live and looks amazing.... thanks for introducing me to something else stunning - you have a gift! Your blocks are lovely, but haven't you only been home a couple of days? Amazing progress. Seems like you have mastered fussy cutting so perfectly. LOVE your blocks. WOW they are amazing, I love the blocks. 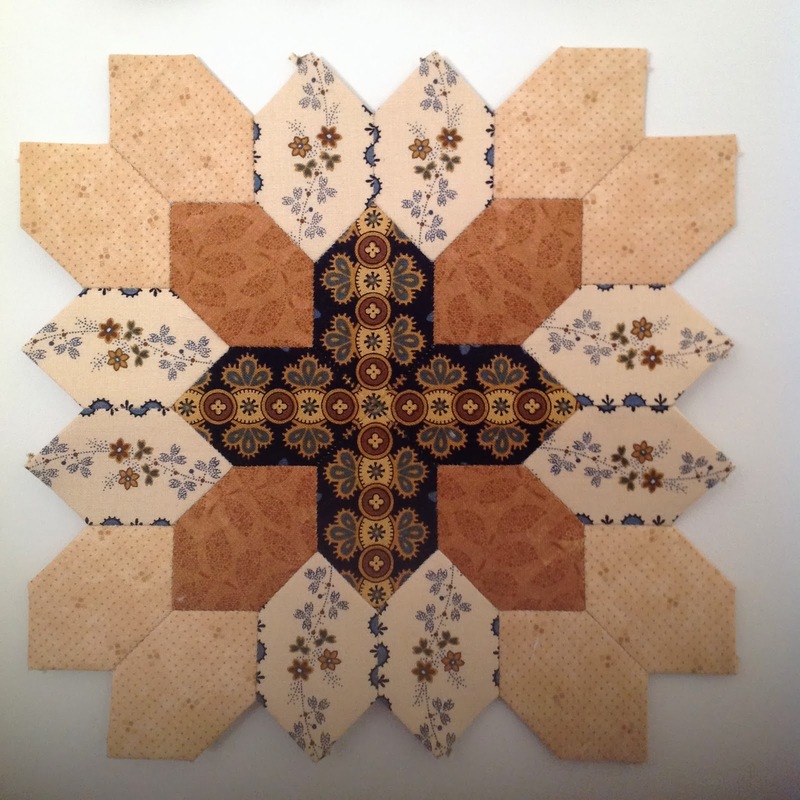 Oh wow, I just love your finished blocks. absolutely beautiful, maybe you need a trip to Threadbear in Castlemaine for more fabrics....do you ever sleep??? Wow! That is impressive! The fabrics look even better now I see them in the blocks. Your work is lovely. Love the blocks-that's pretty impressive work so far! I have never done fussy cutting but yours looks perfect. Keep up the great work! Absolutely gorgeous I am starting to build my collection of civil war fabrics as I have begun to like the colours. Gorgeous blocks! I can't believe how much you've accomplished in such a short time! 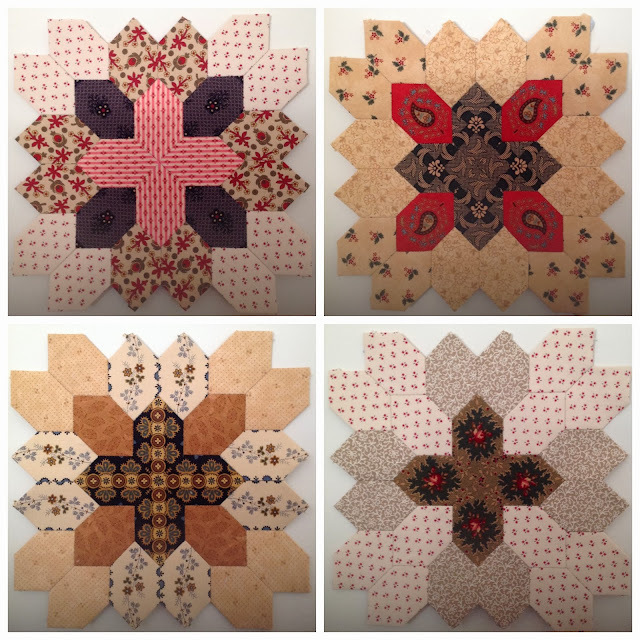 Beautiful blocks Sharon, you are so quick with your sewing! Can't wait to see how it grows once you get more papers! 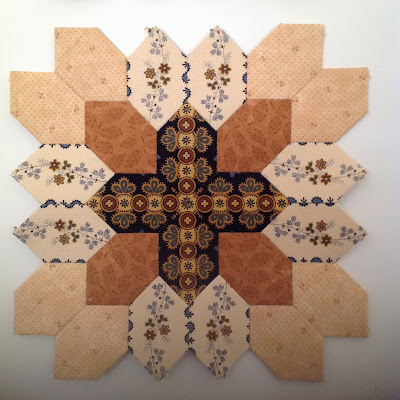 On facebook Sharon there is a group I 've been hexed and I like it.....this quilt features there - good for a look. I've always admired this pattern too. We are so often attracted to the same designs, Sharon! But I've seen a version with just regular contemporary fabrics that still looks great, so I think whatever you choose, it will be beautiful!